Appliance manufacturer Miele has held its biggest-ever launch, with the introduction of nearly 3,000 models following six years of research and development. Spanning 15 product categories, Generation 7000 sees the renewal of the entire product range of built-in kitchen appliances from ovens and hobs to coffee machines, dishwashing and cooling. The collection was presented through a series of immersive theatre presentations at its headquarters in Gutersloh, Germany. Around 2,750 Miele partners from across the globe attended the event, which was held more than 100 times to cater for individual countries. It saw the use of wi-fi connectivity across the appliance categories for remote operation and user assistance, as well as touch and even voice controls. Generation 7000 ovens are available in four specifications and in a choice of four fascias Artline (handleless) and Vitroline (handled) in Graphite Grey, Obsidian Black and Brilliant White, as well as ContourLine and PureLine. Included in the Generation 7000 collection is a pyrolytic oven with integrated camera, allowing remote monitoring (FoodView) by App. The App also allows remote operation, such as opening the door after the cooking programme has finished to reduce residual heat (TasteControl). 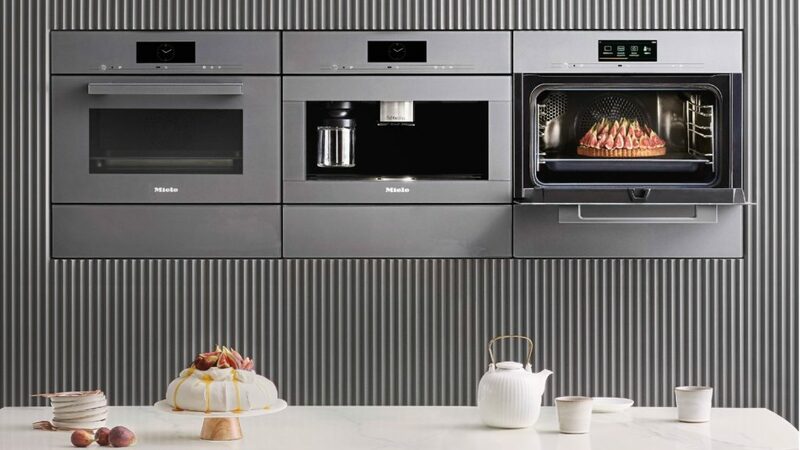 In addition, Miele also introduced MotionReact which will automatically switch on the appliance when the user approaches, such as activating the oven lighting. And it unveiled the Dialog oven, which uses electro-magnetic waves and reportedly reduces cooking times up to 70%. In addition, the Generation 7000 launch saw Miele’s biggest ever investment into dishwashers, having rebuilt 95% of the machine parts. Now featuring touch controls on all models but the entry level dishwashers, the company has introduced AutoDos dosing system with its own PowerDisk capsule featuring a month’s worth of detergent. In addition, the top-of-the-range model featured voice controlled operation. Wine fridges and cooling saw the introduction of touch to open and brilliant white lighting, respectively. While induction hob saw power tracking with LED displays swapping places to follow the pan, and adding to the hood collection was Aura 40 with ambient lighting and scent. Available to retailers in the UK mid-May, Generation 7000 will be on show to consumers at the Miele Abingdon and London Centres, as well as independent retailers, in June.